Jharkhand High Court has recently announced 73 various posts to recruit suitable candidates in the vacant positions. A huge number of aspirants seeking to get Jharkhand state government jobs have applied for the announced posts during the application dates. Candidate selection will be done through written test and interview rounds. The High Court, Jharkhand is initially going to conduct the written test for all applicants as per the scheduled dates. Candidates need to attend the test to qualify for further rounds of selection process. 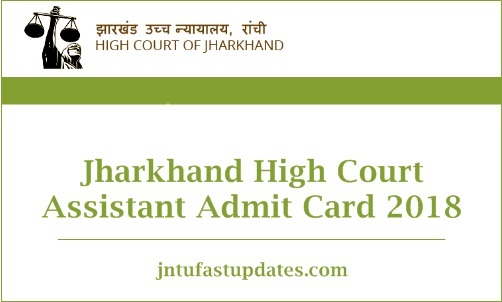 Before going to attend this examination, applicants have to download Jharkhand High Court admit card 2018 from the official portal, jharkhandhighcourt.nic.in. Candidates must notice that the examiners will not be allowed to write the examination without admit cards. Hence it is must to carry Jharkhand High Court Assistant, Cashier Admit Card while going to the examination. Candidates can check more instructions and useful details from this article. Jharkhand High Court is the district level magistrate court. The high court yearly announces various posts based on the requirement. The court has recently announced 73 posts for Assistant, Cashier, Typist and other jobs in JHC. Many of the candidates waiting for JHC Notifications have applied for the announced posts. The Jharkhand HC shortlists the suitable candidates for the announced posts based on their performance and merit in various rounds of selection process. Initially, the JHC will conduct the written test and for the qualified aspirants, JHC is going to conduct the interview round. Candidates qualifying both the rounds with merit will be considered for the JHC jobs. For few posts like Typist, the JHC will also conduct the skill test. Candidates applied for the posts can get ready to face the selection process of JHC. Applicants can go through the admit card to check the details of examination center, date and time of the examination etc. Also, the details of the applicant such as register number, name, DOB, signature, Photograph etc will also be mentioned on JHC Assistant Hall Ticket. After downloading, go through the details keenly and report to the authorities if there is any mistake in any column. The JHC will take the necessary step to correct the printing mistakes. Candidates who are going to face the examination must also carry any of the valid identity proof Xerox copy along with Jharkhand High Court Stenographer Admit Card 2018. Provide the information registration number and Date of Birth etc details. Jharkhand high court assistant exam expected date/month 2018?? ?